BOMBARDIER TALENT 3 electric vehicle. Photo courtesy of Bombardier. 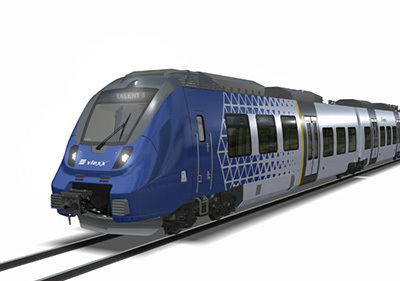 Bombardier Transportation was awarded a contract by the German transport company vlexx GmbH to provide 21 three-car BOMBARDIER TALENT 3 electric multiple units that will be used on the Saar region’s electric rail network in December 2019. "With the expansion of our railway network and our fleet to a total of 84 vehicles, we are ensuring long-term business growth," said Frank Höhler, managing director of vlexx GmbH. "With the new trains, our passengers will experience much more comfortable rides. Passengers will benefit from many extras, like large panorama windows and a modern passenger information system." “This order is a great success for Bombardier and underlines the appeal of the latest generation of our TALENT product family. The new TALENT 3 trains combine the quality and reliability of their predecessors with new elements such as WLAN," remarked Michael Fohrer, managing director of Bombardier Transportation Germany. “We are proud to support our new customer vlexx’s expanding mobility offering with these innovative trains. We also see this contract as a prelude to a long-term, partnership-based cooperation." The low-noise, three-car trains feature 160 seats and room for two wheelchairs and nine bicycles. The trains will also be equipped with sliding steps to bridge the gap between the platform and the train while boarding and alighting. The new generation of TALENT 3 electric multiple units offer modern operational flexibility, low energy consumption and reduced life cycle costs.